Telangana: In a horrifying road accident on the vijaywada-Hyderabad highway, five students of the Osmania Medical College identified as G Laxman, M Pranay, Uday, M Vijay, and Vijay Krishna were killed as the bus overturned. At least 35 others were injured badly with 20 people reported to have suffered severe head injuries. The Driver of the Bus Killed on the spot. Dr Babu Rao, dean of Osmania medical college informed Express. that, the mishap took place when the students were returning from a sports competition in KIMS Medical College, Amalapuram. As Per the Vijayawada police officials, the bus may have hit a tree at very high speed as the front side of the cabin was completely smashed and the bus had overturned on impact. Some of the students were pulled out by villagers from underneath the seats where they had been stuck. 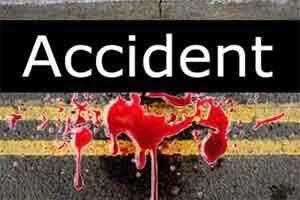 “This accident took place because of the negligence of the driver from Dhanunjaya travels. The driver was drunk and was over speeding the bus and the accident happened. All the students who were travelling in the bus requested the driver to drive slowly but he didn’t listen to them. He died on the spot,” officials added. As reported by Hans india, the administrators and senior officials of the Osmania medical college have blamed the college, pointing out that the mishap which claimed the life of 5 medical students could have been averted if all the standard procedures at OMC were followed in timely manner. “The medical students were supposed to return on Monday, after attending a sports meet at Amalapuram town in East Godavari district. But they decided to take a break mid-way at a resort near Vijayawada. Interestingly the OMC authorities appear to be unaware of this change in their travel schedule, ” officials said. The bus which belonged to Dhanunjaya travels from Amalapuram has given no proper response when students of the medical college called them because over this issue. Now the students are fighting to cancel the license of Dhanunjaya Travels.